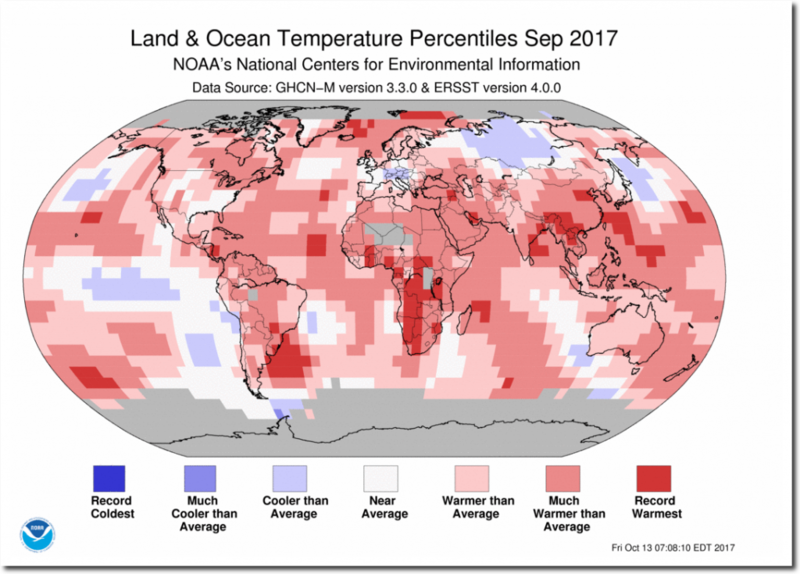 NOAA claims global land temperatures were third highest on record in September. NOAA claims record warmth in central and southern Africa. Their claim is blatant fraud. NOAA had no thermometer readings in most of the “record warm” area of Africa. Satellite data shows that central Africa had close to normal temperatures. NOAA knows they can get away with this, because their criminal behavior is protected by other criminals in the press corps, who have granted them unlimited license to cheat and lie. I can at least say it is fairly accurate where I live here in Ontario, Canada as it was warmer that usual, save for the first 9 days of very cool temperatures. Those first 9 days probably kept it from being a lot warmer compared to the average. Funny about the Africa data yet what I expect with these crooks and the media. You have no way of knowing whether or not the map is accurate without actually looking at the historical thermometer data. September temperatures used to average much warmer in your region prior to 1965. They did not! Canada as a whole is more than 1.5C warmer than the pre-industrial. Ontraio is around that. 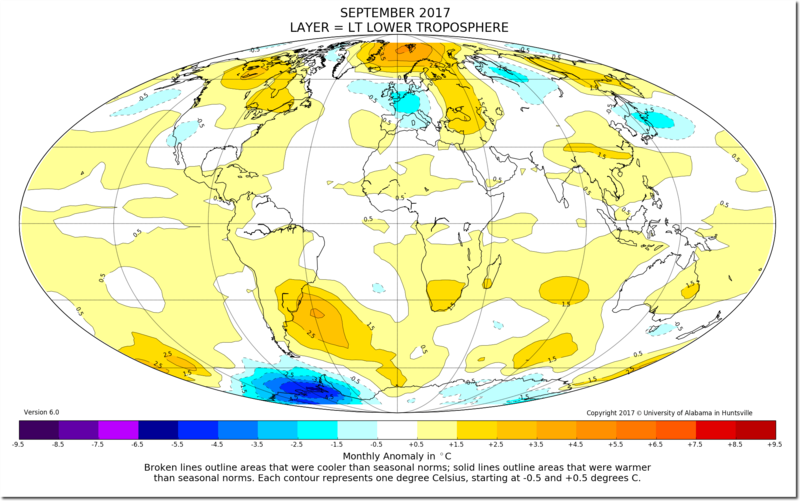 Here is NOAA’s summary for September, globally. The average global temperature set in September 2017 was 1.40 degrees F above the 20th-century average of 59.0 degrees, according to scientists from NOAA’s National Centers for Environmental Information. 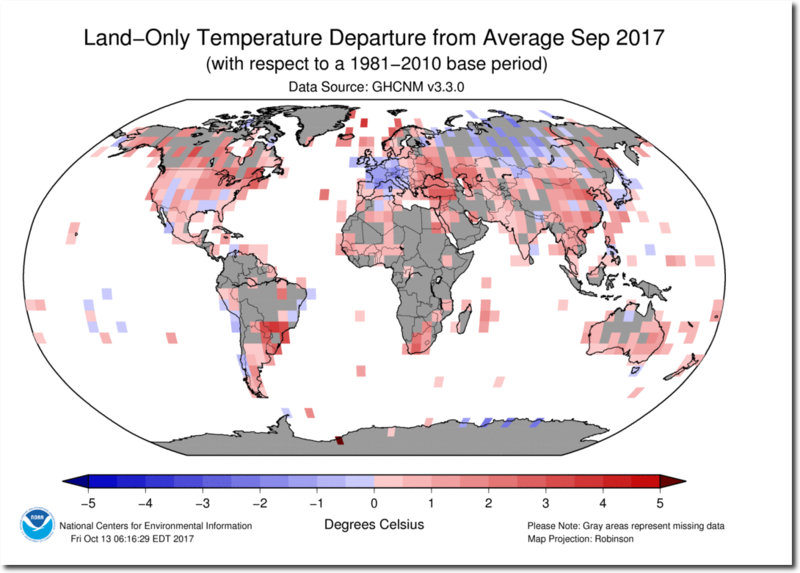 This average temperature was the fourth highest for September in the 1880-2017 record. 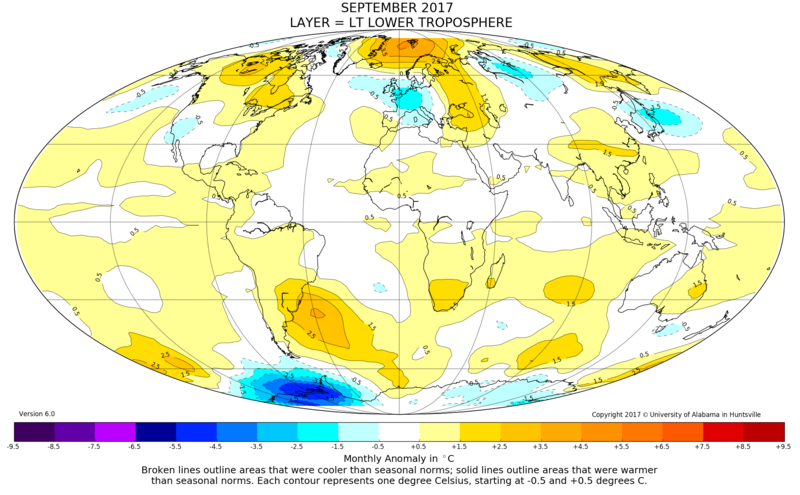 This marked the 41st consecutive September and the 393rd consecutive month with temperatures above the 20th-century average. I guess you missed the point of this post about how NOAA manipulates the data to fit their hypothesis. Take anything that NOAA says, with a strong laxative !! Or you will mindlessly regurgitate it. You are regurgitating propaganda and have no clue what you are talking about. Tony, your posting of historical newspaper accounts and the entire US temp. 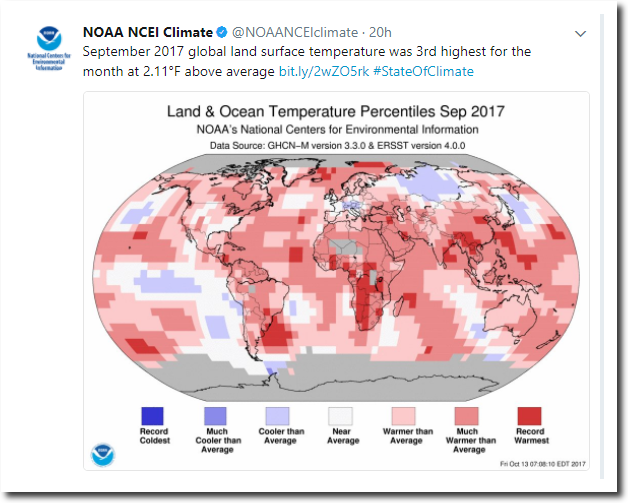 data base is compelling evidence that NOAA is corrupt. Several years ago when discussed AGW with the VADM responsible for the day-to-day management of NOAA’s national and international operations for oceanic and atmospheric services and research, and coastal and marine stewardship and, as happens, a friend of mine, he told me in firmly, that as a non-scientist, I was unqualified to discuss the topic. That was impetus form my long quest of the facts. You have been instrumental in that search for truth. Thank you. NOAA’s fraud is being exposed thanks to you, Tony. There is a lot of swamp cleaning still to do in the U.S. govenment. It will probably take all of Trump’s first term to weed them out. In the meantime, Tony can show them for the liars they are. The land-only map shows below-average readings in the United States, India, Japan and Australia (note Tasmania) that disappear in the land and ocean map. Europe is also significantly warmed in the land and ocean map. There are different base periods. Its 1981-2010 in the temperature anomalies. I’m assuming the second is the result of cooling the past. What the heck does “Blended Land and sea surface temperatures” mean ? How can the blend temps they don’t have? Blending Fiction with reality, obviously. And like always, lots of blue areas where they do have data get “adjusted” to red. Yeah, look at what they did to Europe. Much of Western Europe had a very cool September. For the Netherlands they even switched the data from Blue to Red , warmer than average. Incredible. I was curious about this portion of their presentation. So, a reconstruction of data going back to 1854 with all the missing data filled in using statistics. That is a broad, uninformative statement. Be that as it may, they are really blowing some serious smoke. They might as well admit anything going back in time is no different than a wild guess. What a load! Wow. Think about that statement. They exclude objective data because it contradicts their conclusions. There is actually precious little whole of ocean SST data before 2003. Southern ocean is particularly badly covered, and most of the NH data is in thin lines along the shipping routes and highly subject to ocean oscillations such as the AMO, PDO. Bob Tisdale had a great animation but I can’t find the link. So, when you blend the mostly fictional history of the world ocean temperatures to the increasingly fictional surface temperature record, both of which have been heavily weighted towards progressively higher temperatures, you get a statistical guestimate of impending climatic catastrophe which has been optimally tuned to yield the maximum amount of grant money. Look at India, and other parts of Asia as well. 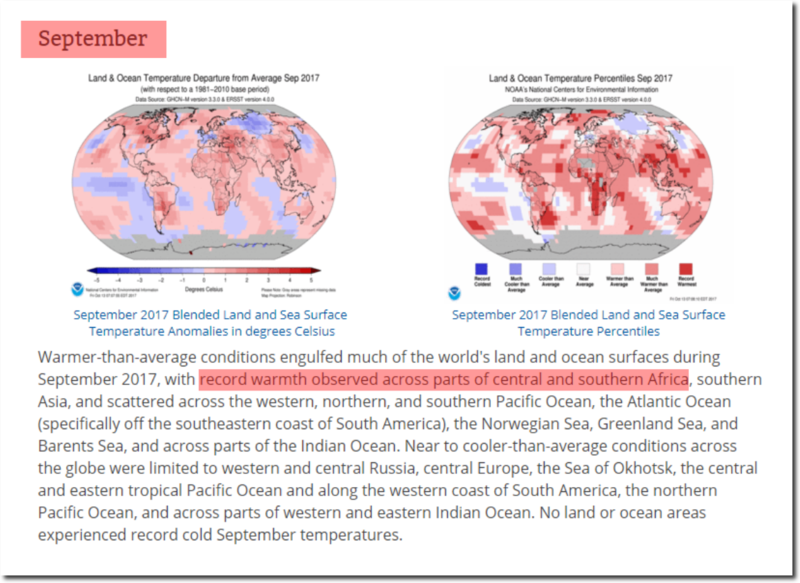 Satellites say “around average… NOAA says roasting hot. as well. The moral of the story is that if it is gray on the first map it will be pink or red on the second. Very few exceptions. Mindblowing as usual. Does anyone know what is the page on NOAA’s website with that image ? I am trying to understand how they are hiding this. Still need to find back my jaw on the floor. If I understand this page correctly, it seems that’s pretty much an average September month for Namibia’s capitale. GHCN thermometers are those special ones that create a warming trend?